The Credit Union Development Program focuses on providing disadvantaged rural communities with access to safe, affordable and reliable financial services. Credit Unions are member-owned financial institutions, they act like a bank in providing safe access to loans, financial advice, a place to save money and fair interest rates, however, credit unions are non-profit organisations owned and run by the community which means they have more capacity to cater to their specific needs and any revenue goes back to benefit the members in the form of business loans, better interest rates, community savings in case of an emergency, etc. The program supports and trains members of the community to form these member-owned institutions. It teaches bookkeeping and basic financial concepts as well as creates a sense of accountability, community cohesion and transparency. The program works in communities that previously had no other financial institutions that could serve them because they wouldn’t qualify for a bank account or because they live in areas so remote that big financial institutions wouldn’t reach them. These community-owned banks form groups called Self-Help Groups (SHG) that focus on increasing financial inclusion. These groups help people like women and people with disabilities that would normally be at disadvantage in financial topics have a bigger voice in the community, have more confidence in taking control of their personal and family finances, work on their leadership skills and help them achieve better opportunities. 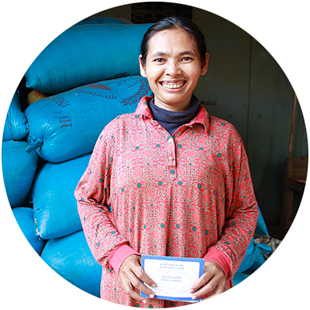 Sokna joined the Credit Union Development program when it was established in her village several years ago. It gave her the ability to save and deposit money into a bank account and take out a small loan to buy fertiliser and new equipment for her cashew nut farm. In 2017 she also joined the livelihood project which gave her further training and she learned new business skills, in addition to gaining a financial education.